Chain Reverse: First U.S. Coin minted at the Philadelphia Mint for circulation. Regular issue coins only; patterns of this series are excluded. The above list is the Top Ten sold values for 1793 Flowing Hair Large Cent, Chain Reverse and the number one coin on this list is the most this coin type, denomination and date has ever sold for publically. These values do not apply to raw coins or coins in any other holder; these values only apply to coins graded and certified by PCGS (Professional Coin Grading Service) or NGC (Numismatic Guarantee Corporation). Also, a few of these coin holders have CAC (Certified Acceptance Corporation) stickers and this is considered further assurance that the coin is the grade and condition stated on the holder's label. You can't buy or sell 1793 Flowing Hair Large Cent, Chain Reverse United States coins for the prices listed in this website unless they're in the same grading company holder, same grade, variety and condition, even then there's no guarantee your coin will sell for the same 1793 Flowing Hair Large Cent value. If you want to learn the value of your 1793 Flowing Hair Large Cent, Chain Reverse then you must know the coin's grade, condition, and if it's authentic. You do this by taking your coin to a reputable coin dealer or sending your coin to PCGS or NGC (fees do apply with these services). If you're not interested in sending your coin to a third party grading service then you should do some research and find a reputable coin dealer instead. I recommend a PCGS Coin Dealer since at least three of their piers have to vouch for them to be a PCGS Dealer. If you can't find a PCGS Coin Dealer then look for local ANA members or coin clubs. 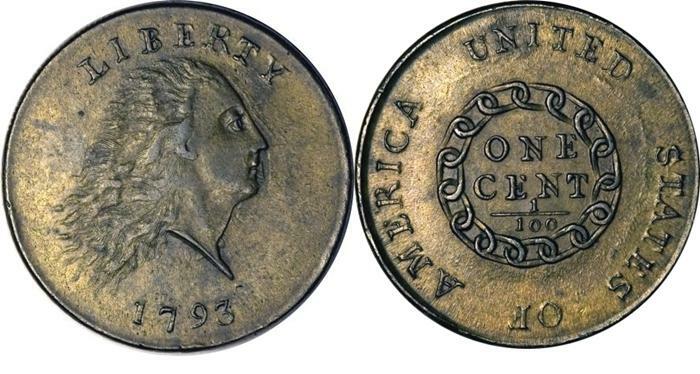 In the mean time you can get an idea of your 1793 Flowing Hair, Chain Reverse, Large Cent's value and grade by visiting CoinHELP! website.